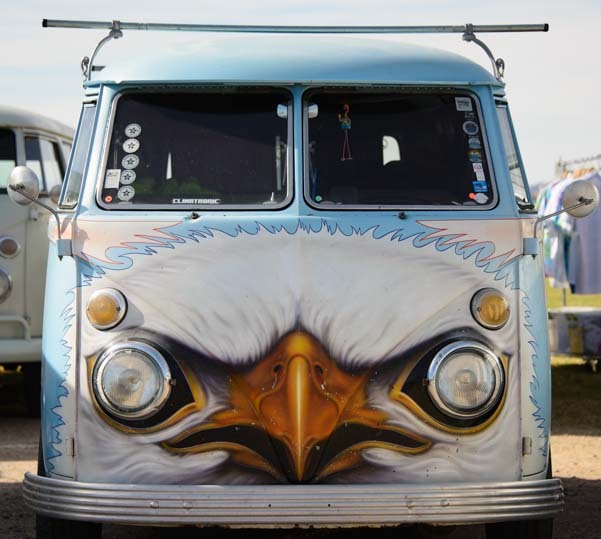 VW Microbus Mania in Lake Havasu Arizona! 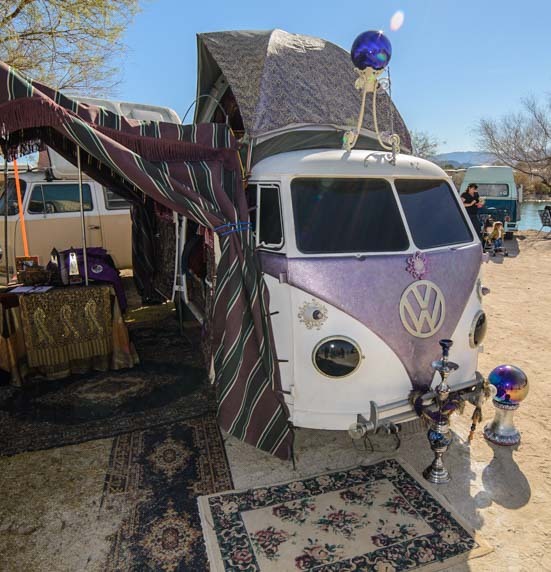 We had so many great pics from the VW Microbus festival, Buses by the Bridge in Lake Havasu, Arizona, that they didn’t all fit in one post. 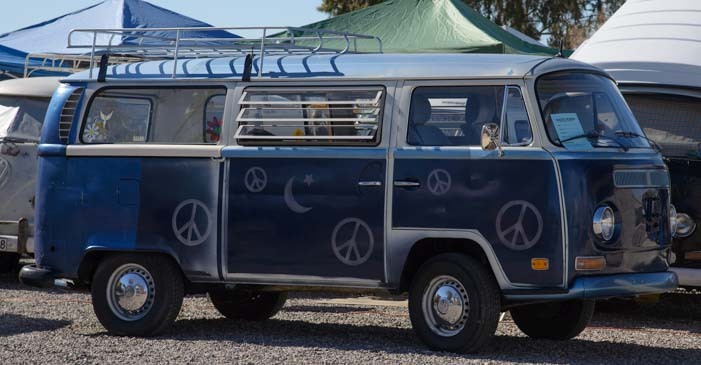 Here is some more Microbus Mania for you! 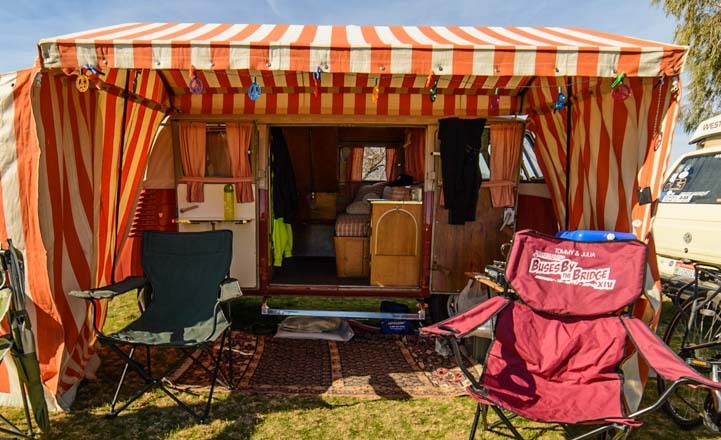 Most of these folks were camping in their micobuses and had them opened up so you could see how they were set up inside. 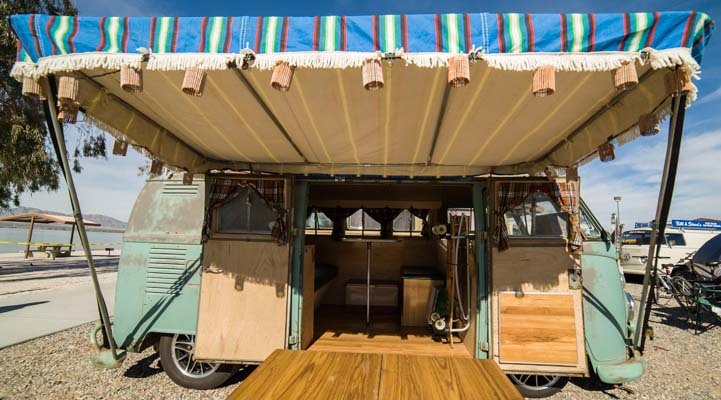 There isn’t a lot of room in these tiny RVs of yesteryear, but they’re just so cute. Enjoy! The “submarine hatch” model got you a little extra headroom inside! Some guys had it made in the shade with wonderful big awnings. A big awning and party lights — made in the shade! There’s a microbus in there?? 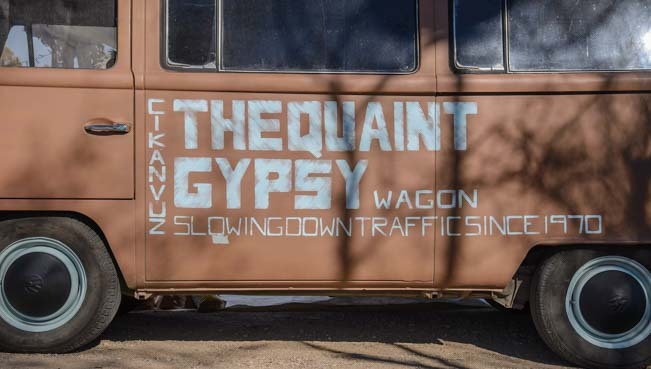 Now here’s a paint job that caught our eye!! Wouldn’t it be crazy to look in the rearview mirror and see this! 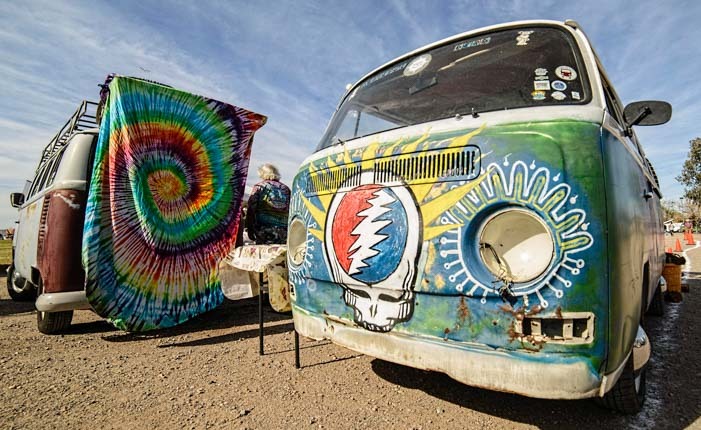 For the Deadheads, there was a Grateful Dead Mobile trimmed with the iconic dancing bears and the turtle from the cover of the Terrapin Station album. The front was tie dye, of course! Groovy tie dye…can’t beat that color scheme! 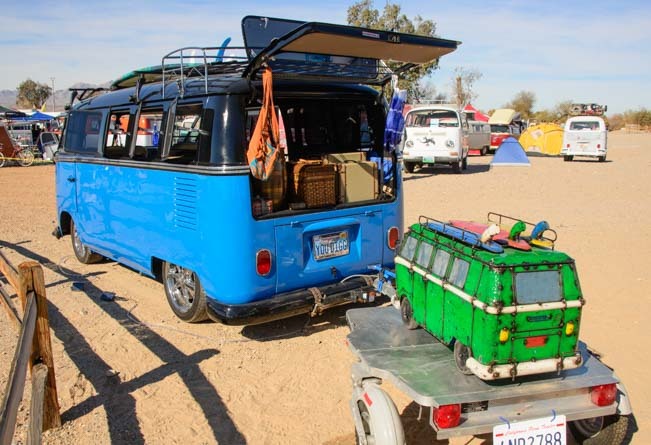 The green mini-Microbus being towed behind is actually a cooler! 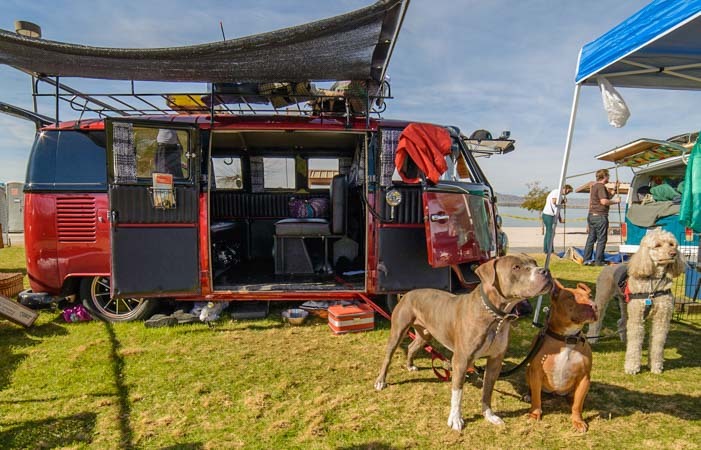 Another guy managed to squeeze three big pooches into his bus somehow! What a fun rally — far out, man! See more Quick Pic posts HERE! This entry was posted in Quick Pics and tagged Arizona, Arizona Northwest, Quick Pics by Roads Less Traveled. Bookmark the permalink. Nostalgic for the old times.